As my business continues to grow, I am making decisions about how I want to proceed. So, after a lot of thought, I have decided to register for GST on the 1st September. Unfortunately this means I will have to add it onto my prices. So I thought I would give you, my loyal followers some advance warning (sorry this post was meant to go up yesterday morning!) You have until the end of Wednesday to purchase goodies without the added GST in my Felt shop. 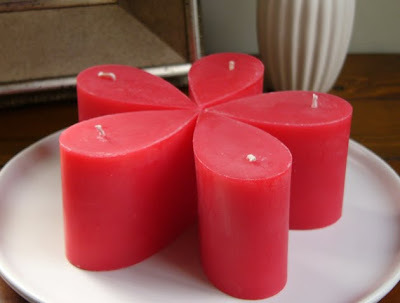 I have decided to absorb the cost on some items for various reasons, and so the following items will not be increasing in price – Soy melts, Scented soy tins (excl essentials), Soy tealights and Heart tealights. As anyone makes things to sell will know, it's always a tough balance to figure out what price to set. I read an interesting blog post last week shared by Lylly-Fysh entitled 'Why handmade is so expensive'. It's a great insight into the work that goes into handmade, so I thought I would share an overview of my processes, inspired by that post. This begins with an idea, and depending on it's complexity, may need to be drawn and designed first, or it may be based on a conventional method or mould. I'll use the teardrop as an example. I make the moulds for this candle by hand, and it has taken me many batches to perfect the design and reinforcing of the mould to get it just right. Then I need to make prototype batches to test out which wick works the best, and whether or not the candle will actually work. This has been a steep learning curve. In earlier days I have rushed this process in order to get a product out, and then not been happy with how it burned down. As you can imagine, the testing can be quite time consuming when you have to burn down each candle to see how it goes, and which one lasts the longest, and burns the nicest. This involves measuring out the correct qty of wax for the number of candles I plan to make, and melting it in a double boiler on a stovetop. 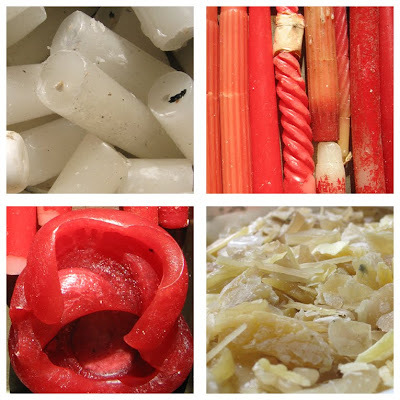 While this is happening I prepare the moulds, and put the wick in them, as well as measure out the fragrance and dye. Once the wax has reached the right temperature, I mix in the dye and fragrance, and pour it into the moulds, taking care not to overfill them, and hoping they are sealed up properly and won't leak. Depending on the type of candle being made, I have to repeat this up to two more times. Usually I wait until the following day to take the candles out of the moulds, as this gives them enough time to set properly. Once I have taken them out of the mould (they are poured upside down) I melt the base of the candle to flatten it off. This entails tidying up the finished candle, and adding the labels and any embellishments, such as the paper bands on the tins. Interestingly, the finishing aspect takes longer that I think, and I always end up under-estimating how long it will take. However I take pride in getting this right, as I think the finishing touches are part what sets my products apart from others. Most of the cost of making my candles is the actual time. Especially for the recycled candles, as I have to filter the wax first, which is quite time consuming in itself, and I don't actually factor this into the cost of my candles. I will try very hard to make sure this is the last price increase this year – hopefully I've got it right this time!